There are several chain restaurants that I will not eat at for various reasons. Usually there is just something really unappealing about their food. Places like Jack In The Box, Hardees, and Denny's all make my list of places I will absolutely not touch. 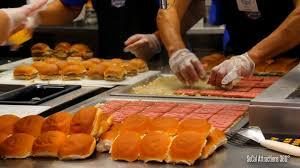 Although my wife likes to point out that I will eat at White Castle. There is one thing that distinguishes one of those three restaurants on my list above: baseball cards. At Jack In Box there is the possibility of E. Coli, or perhaps getting really mediocre food off of a really overcrowded menu. They are like the Cheesecake Factory of fast food, not really good at anything, but you can order all kinds of food. No baseball cards though. Hardees. Gross. No baseball cards either. Which brings me to Denny's. 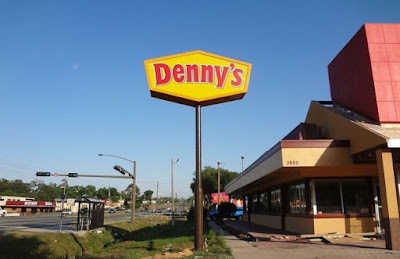 I can't tell you the last time I ate at a Denny's. I am going to say that it is a minimum of 20 years. There was one where I went to college, but it was rather shady. One of those places in town that you do not go near. There were a bunch in St. Louis, I don't even remember a specific location of one though. I am sure at some point I have been to one. At least I think have been to one. What's really important is that they have baseball cards. I posted one Denny's card a week ago that came in a random package. 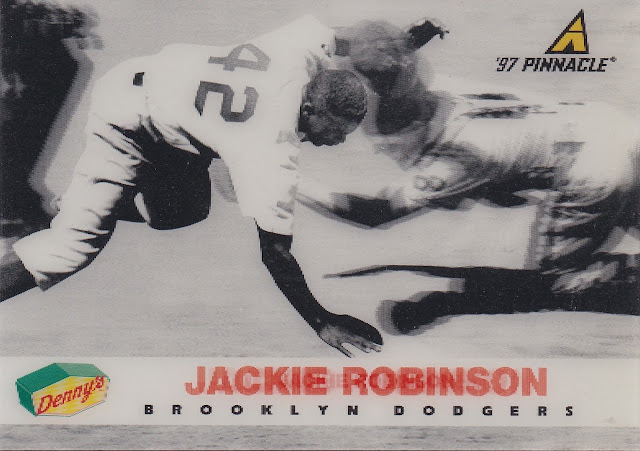 I was pretty excited to see this Jackie Robinson card. I did not have it in my collection, but I knew I had a bunch of these Denny's cards from 1997. Obviously I did not get these by eating at a Denny's, but after going through my collection, it appears that I am missing one card from the set. Several of the cards are in my collection a few times. There are some other quality Denny's sets out there from the 1990s, but this one is my favorite. I like to think of it as a combination of two different classic baseball card products. The fronts of the cards are very similar to the SportsFlix cards. Right down to the texture. have a hologram picture. While the picture does not take up the whole card, this part of the card reminds me a bit of the mid to late 1990s SPx cards from Upper Deck. There are a grand total of 29 cards in the set, but I am technically missing one of the cards from the set even though I have all 29 of the cards from the checklist. A look at the cards in the set. These are the first two numerical cards in the set that I was able to assemble by digging through my card boxes. The Tim Salmon card on the right is actually card number 1. However, Denny's made a Larry Doby card that was also card number 1, but it was only available at restaurants in the Cleveland area. I will go find one at some point. Two pretty good first baseman here. Always forget how good Mo Vaughn was before he left the Red Sox for the Angels. Never quite the same after that point. Still good numbers though. 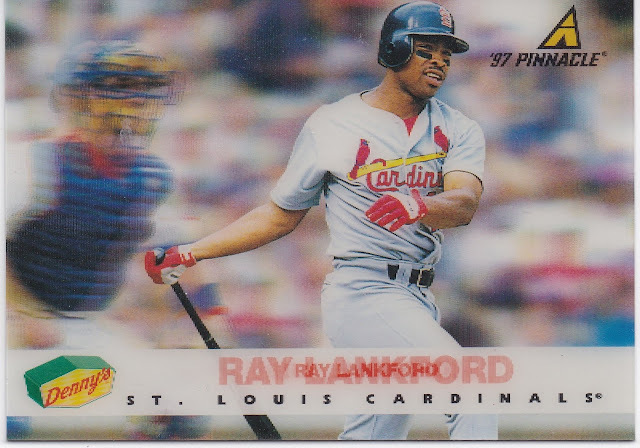 A small checklist of 30 cards should allow for a really strong checklist of players who were active during the 1996 and 1997 seasons, but for some reason there is a Travis Fryman card in here. He was on several All-Star teams and was considered the best player on some bad Tigers teams. Tony Clark was a lot better though. Love seeing John Jaha in here. Not a long career, but he had some great years in the mid 1990s for the Brewers. Had a nice year or two with the A's too. Johnny Damon on the Royals too. Meh. Shall we pick up the pace? McGwire with a mullet. The base runner in the picture is distracting and blurry. I think it's Rey Sanchez, so Spring Training game? ARod was in middle school when this picture was taken. I am pretty sure that someone at Pinnacle added that baseball to the Roger Clemens card. For no reason, here's Jose Hernandez. It looks like they airbrushed him on the card next to Sammy Sosa. The Rockies player in the set was not Larry Walker or Andres Galarraga. I could have also lived with Ellis Burks, maybe Vinny Castilla. Bichette. Terrible. Always a positive when you can post an Expos card. 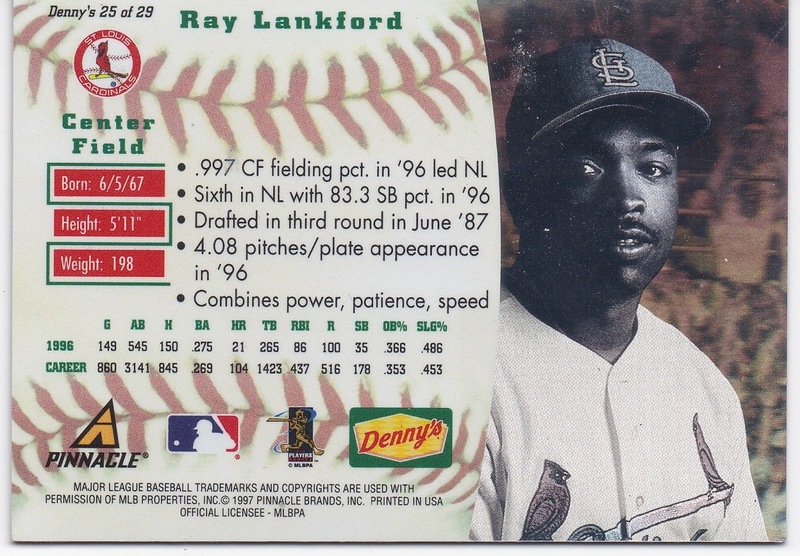 Barry Bonds should be in the Hall of Fame because the numbers on the back of this card are that good. Plus, he was not on steroids yet. Jackie Robinson a second time and Scott Rolen with the Phillies bat boy. Overall, a great set. They do not make these sets anymore, which is probably a good thing in terms of the quality of food consumed by baseball card collectors. However, these were really good card sets. The baseball card gods were smiling down upon me, because they timed the Denny's promotion with my late night college study sessions perfectly. I never actually completed an entire set, but these days they're very affordable... so I'm pretty sure I've added all of them to my collection. Although... I do still need that Doby card. I ended up finding one later in the day after I made this post. I figured if I did not do it then, it would have slipped my mind and I would have never ended up with it.